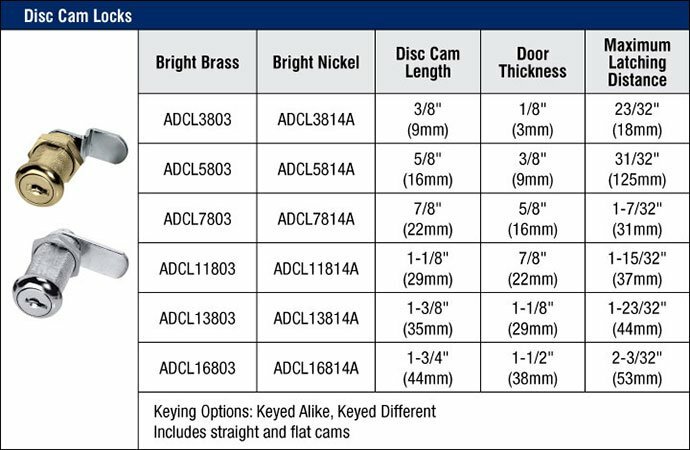 Home>Locks>Cabinet & Drawer>American ADCL38 Disc Cam Lock - 3/8"
American ADCL38 Disc Cam Lock - 3/8"
- Select Finish: Brass (03) or Bright Nickel (14A). - Delivery: Please allow an estimated 3-4 week factory lead time on all American Lock ADCL38 padlocks. Just choose your lock length, finish and keying! American Lock disc cam locks fit most common applications and can be used to secure office and laboratory furniture, appliances, tool and cash boxes, and more. They come in bright brass and bright nickel finishes. To provide you with options, American Lock includes both 90° and 180° stop washers as well as straight and offset cams to provide a range of latching distances with each lock. Each package contains: one cam lock and two cams, two brass keys and ring, straight cam (1-1/2" long x 5/8" wide), 11/32 offset cam (1-1/8" long x 5/8" wide), trim washer, mounting nut, and lock washer for wood installation. - Applications: office and lab furniture, applications, tool boxes and more. - 5 disc tumbler cylinder. - 15/16" head diameter, 3/4" mounting hole diameter. - Brass (ADCL3803) and Bright Nickel (ADCL3814) finishes. Disc Cam Length: 3/8" (9mm). Maximum Latching Distance: 23/32" (18mm). Keying: Choose between Keyed Different (KD) and Keyed Alike (KA). All ADCL38 Cam Locks come with 2 keys. Special Ordering: If you require the No. ADCL38 Cam Lock keyed to an existing key number please leave a note in the Comments Box upon checkout (you can also immediately reply to the Confirmation E-mail with special order instructions). American ADCL58 Disc Cam Lock - 5/8"
American ADCL78 Disc Cam Lock - 7/8"
American ADCL118 Disc Cam Lock - 1-1/8"
American ADCL138 Disc Cam Lock - 1-3/8"